This means we now have the ground works laid out for exciting new changes that are coming soon! Scheduled activities, all activities and history can now be found in a bottom menu of the mobile Therachat app. This menu is always present, compared to the side menu we used to have. Under “Activities” you will find the activities you get on a daily or weekly basis either from Therachat or coming from your therapist. Want to Browse or Do More Activities? Under “Browse” you will find all activities that were made available for you. Those activities are available at all times. So when you’re done with your activities for the day, you can always come here and finish more. Under “Profile” you will find your history. We made it easy to scroll through activities by swiping left/right or up/down on your screen and we made the descriptions visible of all activities so you know what an activity is about before starting it. Clients that use Therachat with a therapist will have one more button in the menu called “Message“. There you can easily message your therapist and be in the know when they messaged you. 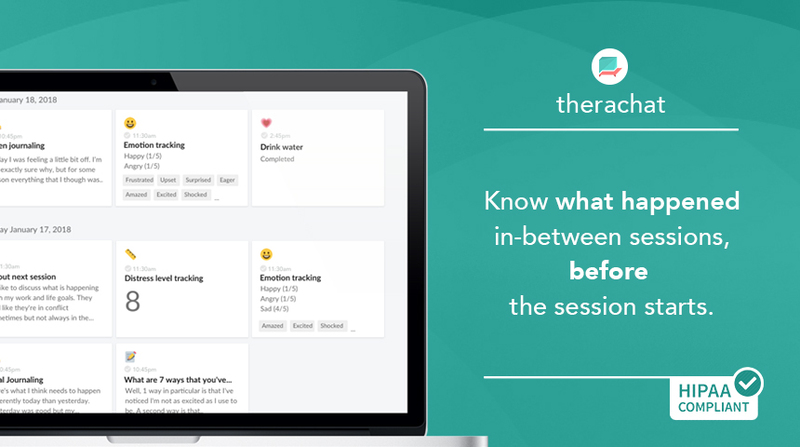 We’re improving Therachat on a daily basis and would love for you to try it out if you’re looking for a tool to help you journal, manage your emotions or track your symptoms.